It was a “very stressful weekend” for the Hubble telescope, according to astronomer Rachel Osten, the telescope’s deputy mission head. In a tweet on Monday, Osten confirmed that the telescope was in “safe mode” after one of its six gyroscopes—devices that contain spinning wheels which help stabilize the device and aim it at subjects of interest—failed. (You can see these gyroscopes extending from the the main body of the telescope in the picture above.) According to NASA, safe mode puts Hubble in a “stable configuration” until ground control can correct the issue. Gyroscopes have failed before. Between 2005 and 2009, the telescope operated with only two, leading up to a 2009 repair mission during which it got six new ones. Two of those had already died when the third failed on Friday. Two of the “enhanced” gyroscopes are already operating. 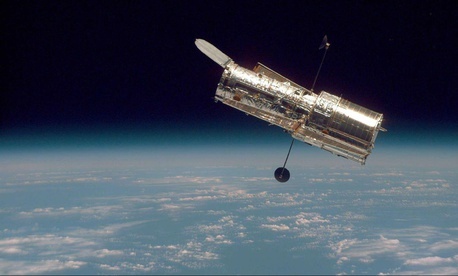 But Ken Sembach, director of the Space Telescope Science Institute, which operates the telescope, told the New York Times that when ground control attempted to fire up a backup gyroscope, Hubble sent garbled messages back to Earth, which means the gyroscope may require rebooting. “We don’t want to start flipping switches until we understand what’s happening,” Sembach told the Times.